Chambly: 120 Aircraft – 96 Lancasters, 16 Stirlings, 8 Mosquitos – of Nos,3 & 8 Groups. 3 Lancasters & 2 Stirlings lost. Chambly, to the North of Paris was the Main Railway Stores & Repair Depot for the Northern French System which the Allied Bombers were trying to put out of action. The local report (provided by the Office of the present Chief Engineer at Chambly) shows that the Raid was extremely successful. Approximately 500 high-explosive Bombs fell inside the Railway Depot Area and serious damage was caused to all Departments. The Depot was completely out of action for 10 days. Fate ofND766 MG-S. This Aircraft had a total of 144 hours when lost. ND766 wore the ID’s MG-P/SND766 took part in the following Key Operations: As MG-P, Nuremberg 30/31st March 1944, Essen 26/27th April 1944; As MG-S, Duisberg 21/22nd May 1944. ND766 was one of 2 No.7 Squadron Lancasters lost on this Operation. See: ND590 Airborne 23.56 23 June 1944 from Oakington tasked to Bomb the Flying-bomb site at Coubronne. Four of the crew, including F/L Wakefield, are buried in Esquelbecq Military Cemetery; Sgt Watson & Sgt Boulger are buried in Wormhout Communal Cemetery, while Sgt Boutell is buried at Ledringham Churchyard where he is the sole Airman amongst 52 Service Graves. F/L MG Wakefield KIA Sgt JM Watson KIA F/L F Lively KIA F/O CM Andrew RCAF KIA F/S FJ May KIA Sgt K Boulger KIA Sgt RL Bouttell KIA “Nuremberg was not significantly damaged. The Nuremburg raid of 30/31st March 1944 saw the mass slaughter of 100’s & 100’s of Aircrew,– it was ‘Black Thursday’ that was the Squadron’s worst night of the War. One dumbstruck Gunner, surveying the German Countryside from the Tail End of a Lancaster that Night in March 1944, would describe his comrades’ Funeral Pyres stretching 60 miles into the distance. The RAF lost 545 Crewmen & 106 Heavy Bombers. During the Raid the British lost 96 bombers shot down & a further 10 written-off after landing. Nuremberg was not significantly damaged. Flight Sergeant Bob Gill was a ‘Tail-end Charlie’, the Rear Gunner in a Lancaster Bomber from 35 Squadron, a Pathfinder Unit whose job was to ‘light the way‘. Now 90, and with the Distinguished Flying Medal to his name, the retired Surrey Accountant sums it up succinctly: ‘It was just a disaster.’ He is not exaggerating. This was, in fact, the worst night in the entire History of the RAF. It remains etched in many minds to this day. 149 Aircraft – 77 Halifaxes, 64 Lancasters, 8 Mosquitos – of Nos 4 & 8 Groups attacked Railway installations in the Gassicourt Suburb of Mantes La Jolie, to the West of Paris. 2 Lancasters & 1 Halifax lost. Bomber Command’s records state that ‘Stores Depots & Locomotive Sheds’ were severely damaged but the local report shows that some of the bombing fell outside the Railway objective. The Western part of the Town – including ‘Old Mantes’, the suburb of Gassicourt and the Hamlet of Dennemont – were all Bombed. 510 Lancasters & 22 Mosquitos of Nos 1, 3, 5 & 8 Groups carried out the 1st large Raid on Duisburg (In the Ruhr for a year. 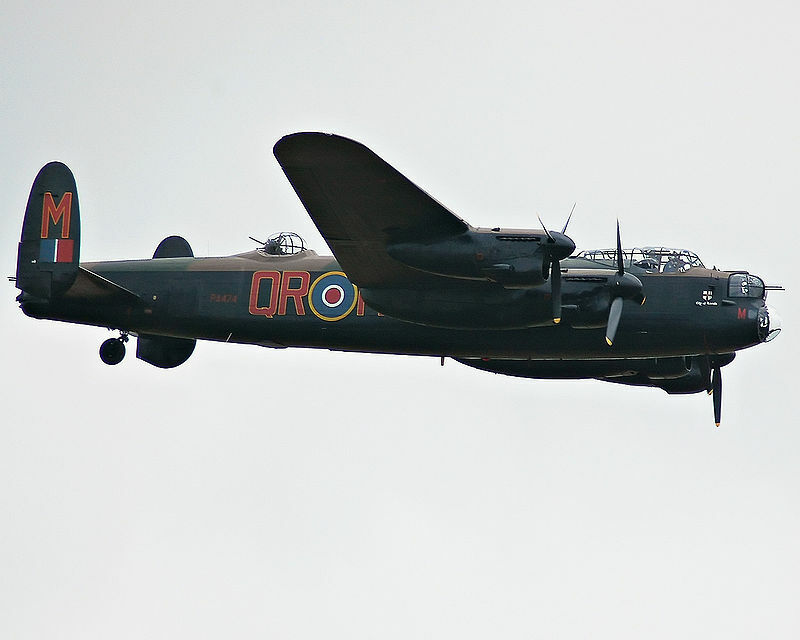 29 Lancasters were lost, 5.5% of the Force. The Target was covered by cloud but the Oboe Sky-marking was accurate and much damage was caused in the Southern areas of the City. 350 Buildings were destroyed & 665 seriously damaged but no other details of material damage are available. 124 people were killed. 361 Lancasters and 14 Mosquitos of Nos 1, 3, 6 & 8 Groups carried out the 1st large Raid on Dortmund for a year. 18 Lancasters were lost, 4.8% of the Force. The Attack fell mainly in the South-Eastern Districts of Dortmund, mostly in Residential areas. The Raids on Dortmund & Brunswick were the last Major Bomber Command Raids on German Cities until after the Invasion Forces were firmly established in Normandy. 1 Lancaster from 12 Squadron (NE134). Total effort for the Night: 1,023 sorties, 34 Aircraft (3.3%) lost. Fate of JB661 UM-C2. On Sunday, 07 January 1945, (a part of) the Aircraft of the 626 Squadron (RCAF), took off for a Mission to Munchen in Germany from a Station (airfield) in or near Wickenby. One of the Crew members was Flight Sergeant K R Josl in RCAF. He departed for his Mission at 18.47. He flew with an Avro Lancaster (type III, with serial JB661 and code UM-C2). His Mission and of the other crew members was planned for Monday, 08 January 1945. 442 Aircraft – 264 Lancasters, 162 Halifaxes, 16 Mosquitos – of all Groups except No.5 to attack 2 Railway Yards at Aachen – Aachen-West & Rothe Erde (East of the Town). These were important links in the Railway System between Germany & France. Aachen is in Western Germany near the Border with France. 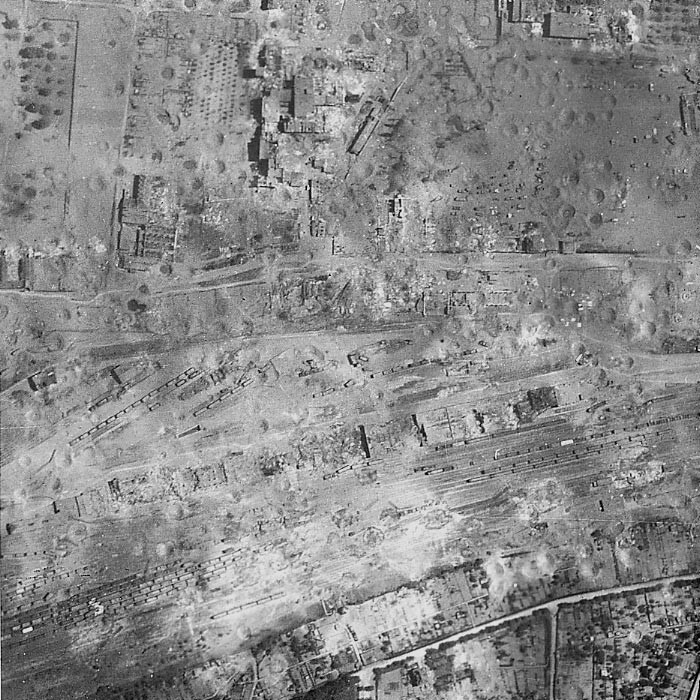 The Aachen report duly records that the 2 Railway Yards were the Targets Attacked, with the Railways to the East of Aachen being particularly hard hit. Because this was a German Town, Bomber Command sent more Aircraft than normal for Railway Raids and many Bombs fell in Aachen itself and in Villages near the Railway Yards. The Monheim War-industry Factory and the Town’s Gasworks were among the many Buildings destroyed. 207 people were killed in Aachen and 121 were seriously injured. 14,800 people were Bombed-out. Several Villages near the Railway Yards also incurred casualties; Eilendorf, near the Rothe Erde yards, had 52 people killed. The Aachen report comments on the great number of high-explosive bombs and the small number of incendiaries dropped. There were only 6 large Fires, 288 high-explosive Bombs were found to be duds, approximately 10% of those dropped. Losses: 25 (7 Lancasters & 18 Halifaxes), 5.7%. None lost from 12 Squadron. Fate of ND387 “Although lost on a Training flight, this Aircraft, plus 3 other Lancasters have been included in this file of Operational Losses since they were all shot down by enemy Intruders during Exercise Gisela, thus, Technically, KIA. Serial Range ND324 – NE181. This Aircraft was one of 600 Lancaster Mk.IIIs ordered from A V Roe (Chadderton) and delivered from December 1943 to May 1944 with Merlin 38 Engines. ND387 was delivered to No.83 Sqdn 10th January 1944, to No.7 Sqdn 10th February 1944, to No.90 Sqdn 10th October 1944, to 1651CU 18th February 1945. Took part in the following Key Operations; With No.83 Sqdn No Operations; With No.7 Sqdn as MG-C, Leipzig 19/20th February 1944; Schweinfurt 24/25th February 1944; Stuttgart 15/16th March 1944; Berlin 24/25th March 1944; As MG-O, Mailly-le-Camp 3/4th May 1944; With No.90 Sqdn, Nuremburg 19/20th October 1944; Attenbeken 14th February 1945-Daylight; with 1651CU-shot down by Intruder 3/4th March 1945. No record of total hours. Shot down 01.15 – 4th March 1945 crashing near Woolfox Lodge Airfield, Rutland. Those killed are buried in various cemeteries in UK. Three are buried in Cambridge City Cemetery. F/S A Howard KIA Sgt AW Darling KIA Sgt WJ Pullan KIA F/O KC Millar KIA F/S RB Wilson RNZAF KIA Sgt AW Taylor KIA Sgt J Thompson. 78 Lancasters and 5 Mosquitos of No 8 Group attacked the Airfield at Rennes in good visibility. The Marking was good and the Bombing was very accurate. Much damage to the Airfield Installations was caused and there was a large Explosion, probably in the Bomb Dump. Fate of this Aircraft – April 1944 The Aircraft was allocated to 7th Squadron. The Aircraft was allocated the code letters ND852 MG-D. 25th August 1944 Aircraft was lost at Russelsheim.